Poke the eggplant all over with a fork. Place it in a 375 degree oven and roast it for about an hour, until it is super soft. Meanwhile, bring the vegetable stock to a boil in a large pot with a generous pinch of salt. Whisk in the grits, then lower the heat. Place the paper over the pot, and then secure the pot’s lid. Leave this alone over low heat for about 20 minutes. When the polenta is done, pour it into a square cake pan and level it to about 1.5-2 inches thick. Allow to set at room temperature. When the eggplant is done, slice it open and scoop out the soft insides. Place them into a bowl, and add the lemon juice, cream, cheese, and grated garlic. Salt and pepper to taste. If you wish, process this mixture in a small food processor so that it is of thinner viscosity. Keep it warm over a low flame while you finish the polenta and cook the vegetables. Slice the broccoli lengthwise, so you have long spears that include both stem and floret. Slice the carrots and squash thinly. In a cast iron pan, heat some olive oil, and throw in the garlic, bay leaf, peppercorn, and sage. Cook them over medium heat until they are nice and fragrant, then add the vegetables, stirring everything together. Pour on the wine, and let everything simmer as the wine reduces. Add salt and pepper. Melt the butter in a cast iron pan over medium heat. Crack the egg onto a plate, and beat the yolk and the white together. Dump the pretzel crumbs onto a second plate. Now, cut the polenta into triangles, and gently toss the triangles in the egg first, and then the pretzel crumbs. Transfer them to the cast iron with butter and fry on both sides until brown. 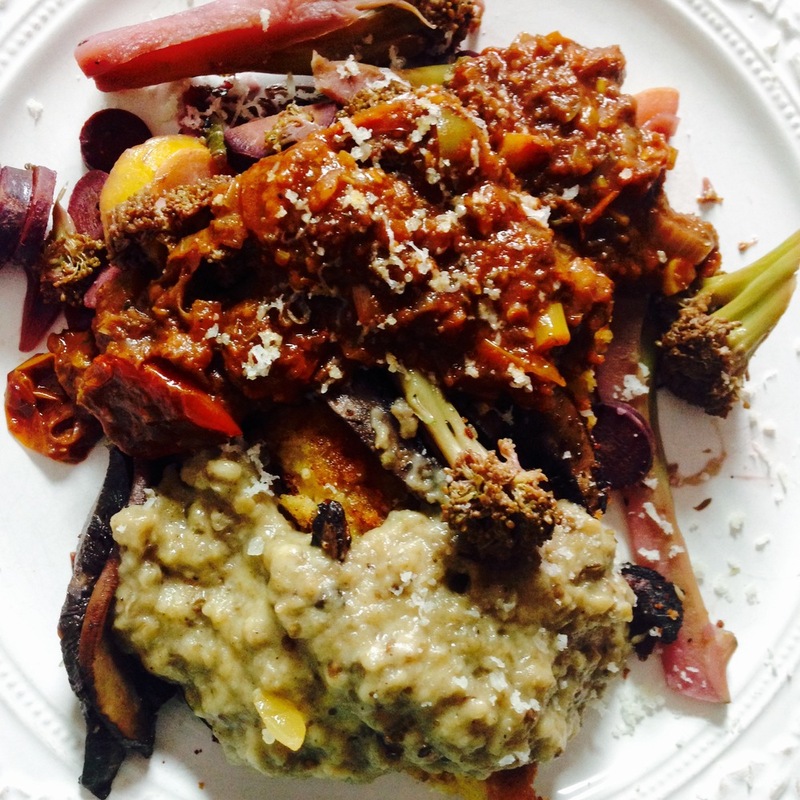 Serve plates with the polenta on the bottom, smeared with eggplant sauce, and topped with the marinated veggies. We also enjoyed some roasted cherry tomatoes and caramelized onions with ours.